We’d love your help. Let us know what’s wrong with this preview of Eye of the Moon by Ivan Obolensky. To ask other readers questions about Eye of the Moon, please sign up. WOW!! I LOVED THIS BOOK. IT WAS AMAZING. A MUST READ. I CAN'T WAIT TO GET THE HARD COPY. SO I CAN READ IT OVER AND OVER AGAIN. THIS BOOK WAS VERY WELL WRITTEN. I LOVE HOW PERCY AND JOHNNY REUNITED. I LIKE THE HOUSE MANAGER IS SO COLD BUT IN A GOOD WAY. ALL THE MYSTERY MAKES ME WANT MORE. ONE OF THE BEST THRILLERS I HAVE READ ALL YEAR. EVERY PAGE I READ I WANTED MORE AND MORE. READING EYE OF THE MOON WAS SUCH AN ENJOYABLE EXPERIENCE. THIS BOOK WAS FULLED WITH, ADVENTURE, HUM MY FIRST REVIEW EVER!!! This is a gothic-type mystery of how Aunt Alice died while reading The Egyptian Book of The Dead. The story unfolds 20 years later where Johnny, Percy and their family and guests find out the truth amidst a celebratory dinner at Alice’s Estate “Rhinebeck”. The themes of occult, mystery, new love, old acquaintances, and new and old secrets occur in this 542 page novel. For a book by a debut author this was very well written. I haven’t read a book written this well in a long time. The words flowed This is a gothic-type mystery of how Aunt Alice died while reading The Egyptian Book of The Dead. The story unfolds 20 years later where Johnny, Percy and their family and guests find out the truth amidst a celebratory dinner at Alice’s Estate “Rhinebeck”. The themes of occult, mystery, new love, old acquaintances, and new and old secrets occur in this 542 page novel. For a book by a debut author this was very well written. I haven’t read a book written this well in a long time. The words flowed smoothly and made sense, I didn’t have to reread paragraphs. I liked that this story was new and didn’t have recurring plots that I’ve seen before. The one thing I didn’t like and that made this book not a 5 star book for me is the length. It’s just my preference to be written at 300-350 pages. I still think this was a good read and that you should pick it up if you like gothic-type mysteries with a lot of character development and a new story line! This comes out February 6, 2018. I gave this book 3.5-4 out of 5 stars. It had been a while since I'd picked up a novel and not only finished it but gobbled it up hungrily. "Eye of the Moon" is now one of my favorite books and a concoction of all the things that spike my curiosity. The occult, family intrigues, a mansion with a dark personality of its own, and profound characters that you commit to are the stuff "Eye of the Moon" is made of. This story had a way of making me think of Downton Abbey and simultaneously make me understand why that show was such a gem. Nothing can really compare, though Eye of the Moon does try. And for that I appreciate it. We are introduced to our two protagonists as it were in Percy and Johnny as they navigate a stressful weekend at the family estate, Rhinebeck, with Johnny's outlandish family and their friends. This is all told from the point of view of Percy who thankfully is a rather good narrator to follow. He was an average character. I related and felt for him no more or less than any other. Intermixed in the various pieces at play during the weekend are the inheritance of Johnny's grandmother's fortune, Johnny's eccentric Aunt Alice's treasures and mysterious death that looms over the grounds, and the motivations for the people who are attending the get together under the guise of Johnny's parent's anniversary. Having written it all down I now fully realize just how many things are going on in this story and the writing does a masterful job of hitting all the sweet spots. You get all the information you need to progress the story without feeling overwhelmed by any of it. The prose would have to be my favorite thing about this book. It felt even keeled. I was never stressed over the characters while reading and I feel the writing style added to that. This may not be what the author was going for as this is supposed to be a mystery, but I would compare it to a Scooby-Doo/Agatha Christie. It was a fun romp, but my blood pressure never rose. I wouldn't say that is a requirement in reading a mystery, but it never hurts and usually makes the read invigorating. Nonetheless it did leave me intrigued and it was always hard to put down when I had to pull myself away. The pace did leave me confused at times as the writing as I said leaves you feeling calm, while the story all takes place within a matter of days. I felt the ending was a bit rushed for the build-up that was occurring throughout. There was no "Ah-ha" moment which again I love in mystery, but I suppose is also not a requirement. It wasn't that I figured out the mystery early on, though some things I managed to guess correctly, it was that the reveals were written in the same flat, calm tone that simply had you putting down the novel when finished and proclaim, "alright, then." Some story elements and character development also felt rushed due to the time frame of the story, but mixed with the calm prose it felt almost right in what was happening. (view spoiler)[I wouldn't agree to marry a complete stranger that I had just met after a weekend together. I don't care what wealth or title came with it. It was just too bizarre especially since they kept going back and forth on liking and hating each other. Then there's the whole thing where the lady had slept with her now fiance's bio-dad a long time ago and the inappropriate flirting the guy does with his future mother-in-law. It's all just too incesty to me. (hide spoiler)] I'll admit this left me feeling weird, but I moved on. Lastly, the ending left a bit of a cliffhanger that had me feeling a bit confused. I'm not sure what to expect; simply a mysterious ending to a one off tale, or the start of a series about this family and their occult antics? I guess that is left up to the author, though I wouldn't mind maybe one more story with these characters. TLDR/I enjoyed the book, but wished that the reveal had been more exciting and the characters more challenging. 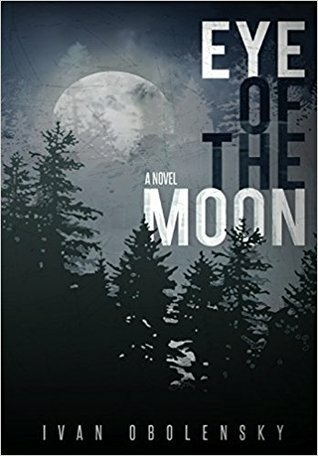 Eye of the Moon begins innocuously with the reunion of two childhood friends--Percy and Johnny--whose friendship broke up several years back with the demise of their joint business venture. But their bromance is quickly rekindled. Johnny is off to spend the weekend with his family and some mysterious guests. He suspects he's being set up to meet the daughter of family friends with an eye to future nuptials. He isn't at all sure that is what he or the woman in question would want. What Johnny doe Eye of the Moon begins innocuously with the reunion of two childhood friends--Percy and Johnny--whose friendship broke up several years back with the demise of their joint business venture. But their bromance is quickly rekindled. Johnny is off to spend the weekend with his family and some mysterious guests. He suspects he's being set up to meet the daughter of family friends with an eye to future nuptials. He isn't at all sure that is what he or the woman in question would want. What Johnny does want, though, is to do some research into a family mystery. And he wants Percy to join him as a buffer between himself and the young woman and as a co-investigator of the mystery. Percy is happy to agree. Together they set off to spend the weekend at Johnny's ancestral home in rural New York--Rhinebeck, where Percy grew up more or less as a member of the family. The two young men are welcomed home by the staff and Johnny's bull terrier, Robert the Bruce. From then on, the mysteries multiply. Rhinebeck is at once lush with the comforts of wealth and beset by the uncertainties of a dark past. As the weekend progresses, Percy learns that memories and relationships are not what they seemed before his arrival at Rhinebeck. By the end of the weekend, he must reinterpret his memories and redefine his relationships. If Downton Abbey and Gossip Girls had a love child named Wednesday (as in Adams), she would live in this upstate New York world of well chilled Cristal privilege, inter-generational love triangles, cutthroat business deals and occult deaths with a Victorian flair. In Eye of the Moon, the two main characters are Percy and the deceased aunt of Percy's best friend and almost brother Johnny; Alice. This is a glamorous universe; an estate in Rhinebeck, where everyone chang I can't wait to see the movie! This is a glamorous universe; an estate in Rhinebeck, where everyone changes into appropriate Gatsby-an dinner attire before entering onto the stage of a friendly family gathering where nothing is as it seems on the surface and no one really is who you think they are. Was Aunt Alice really cursed and murdered by supernatural powers? Is Stanley, the family’s butler and Alice former confident, trying to help or hinder Percy and Johnny's investigation? What role will the beautiful Brunhilde von Hofmanstal, daughter of the Baron and his stunning wife, play in Percy's life? And who is really Alice's abusive ex-husband, the mysterious Lord Bromley? I thoroughly enjoyed this book and wanted to give it 4 1/2 stars. This is such a great book! Filled with mystery, magic and a healthy dose of humour, this book is everything you'd expect from reading the blurb. Eye of the Moon is filled with twists and turns and all the characters are instantly relatable, as well as realistic. Even if some descriptions do get a bit long, I didn't grow bored. It just made me want to read faster. Because everything was connected in this suspenseful mystery. Another great thing about this book is that you actually won't know, or won't be able to guess what's going to happen at the end until you actually do get to the very end. I must admit I was a tiny bit overwhelmed by the ending (view spoiler)[(mainly because of all that large amount of money and calculations) (hide spoiler)], but I'm sure that won't happen again when I reread this book in the future. This is one of those books where you'll have a sudden realisation while flying through the pages that you don't want the book to end. If there ever will be a sequel to this book, I'll definitely read it. Eye of the Moon brings to mind flavors of Downton Abbey and Agatha Christie with a dash of paranormal to taste. It is suspenseful and intriguing. It "reads" smoothly like a fine scotch, easily leading you in to turn each page. There is history, formality and the magnificent illustrated setting of Rhinebeck. Eye of the Moon starts off simple enough with our two main characters and their slightly complicated relationship. Straightaway, we are given our push and pull to carry us through the ups, dow Eye of the Moon brings to mind flavors of Downton Abbey and Agatha Christie with a dash of paranormal to taste. It is suspenseful and intriguing. It "reads" smoothly like a fine scotch, easily leading you in to turn each page. There is history, formality and the magnificent illustrated setting of Rhinebeck. Eye of the Moon starts off simple enough with our two main characters and their slightly complicated relationship. Straightaway, we are given our push and pull to carry us through the ups, downs, twists and turns through the story at Rhinebeck and all the characters that flush out the exciting and mysterious circumstances that come into play. Then there is the paranormal undercurrent to the estate itself. It’s like a hint of just the right spice to set the whole story in a precarious state of balance. Amazingly, exciting tension all while following our characters through their storyline. What a great time I had reading Ivan Obolensky’s Eye Of The Moon! Full of wonderfully fresh characters, it’s a story full of stories that become interwoven as the novel unfolds. Looming over the book and all the characters is the fabulous estate of Rhinebeck, part gothic castle, part Downton Abbey and part upstate New York country home. The estate holds many secrets, mysteries and the hearts of all who have lived there or hope too. But it’s the characters that we take with us and hope to see aga What a great time I had reading Ivan Obolensky’s Eye Of The Moon! Full of wonderfully fresh characters, it’s a story full of stories that become interwoven as the novel unfolds. Looming over the book and all the characters is the fabulous estate of Rhinebeck, part gothic castle, part Downton Abbey and part upstate New York country home. The estate holds many secrets, mysteries and the hearts of all who have lived there or hope too. But it’s the characters that we take with us and hope to see again. Finely drawn, unique and complex these are less characters in a book and more people we come to know better as we spend time with them. Comedy, romance, death, passion, mystery and magic are all elements that drive the story. Full of suspense and always revealing new surprises this novel is just plain fun to read. First let me explain why I chose this book. I love the title and cover for one thing. I wanted something to take outside with me to read while sitting in the sunshine and convincing my newly adopted rescue dog that she was safe and secure. Another factor was that I wouldn't binge read it. Wrong on the last. I'm not a mystery reader, but missing is another thing. Missing can be interesting as long as it is not as convoluted as Gone Girl. And, last but not least, I love the name Ivan Obolensky. Th First let me explain why I chose this book. I love the title and cover for one thing. I wanted something to take outside with me to read while sitting in the sunshine and convincing my newly adopted rescue dog that she was safe and secure. Another factor was that I wouldn't binge read it. Wrong on the last. I'm not a mystery reader, but missing is another thing. Missing can be interesting as long as it is not as convoluted as Gone Girl. This is a good book! The story holds on until the end when the nagging doubts begin to creep in, then doubts about your doubts, it's a good story! "I just finished reading Eye of the Moon. It was a excellent, fantastic book. I loved the way the characters were presented, I felt I really got to know each one of them and, mostly, I did understand their uniques personalities. The book has mystery, joyful moments, absolutely interesting passages and the more I read, the more I was unable to put it down. I am so eager to get the sequel so I can find out what happened to Percy, Bruni, Maw, Stanley and the other individuals that were involved in lo "I just finished reading Eye of the Moon. It was a excellent, fantastic book. I loved the way the characters were presented, I felt I really got to know each one of them and, mostly, I did understand their uniques personalities. I am so eager to get the sequel so I can find out what happened to Percy, Bruni, Maw, Stanley and the other individuals that were involved in love, adventures, past secrets they all shared and decisions made that affected each one of them. This book was a real treat. It’s definitely a fun gothic family mystery with some supernatural elements. It’s about the family secrets of a very wealthy family and their friends. It is set in the 70s, but since the family is so wealthy, it reads like something from a Victorian novel. I won’t give away anything, but there are a lot of twists in the second half of the book. Once they start up, you get one insight after another. Some of them are expected and others come out of the blue. It sets up This book was a real treat. It’s definitely a fun gothic family mystery with some supernatural elements. It’s about the family secrets of a very wealthy family and their friends. It is set in the 70s, but since the family is so wealthy, it reads like something from a Victorian novel. I won’t give away anything, but there are a lot of twists in the second half of the book. Once they start up, you get one insight after another. Some of them are expected and others come out of the blue. I was given an advance readers copy of this book, and it took me a bit to start it. However, once I did, I read it straight through. Not my usually genre of book, and the writing is very descriptive so sometimes the story can be a bit long, but an interesting take on the magic stories that are so popular right now. The character building is really what is enjoyable and following a gothic, 70s, magic story was very enjoyable. Great book! Thanks for the opportunity to review. Eye Of The Moon is a well written, enjoyable gothic mystery filled with secrets, treasures, twists and turns, and the paranormal. The character development was excellent with Percy, Johnny, and Robert the Bruce, keeping me interested from the beginning of this ingenious tale, to the end. The descriptions throughout the novel are also well done which adds great depth to this great story. Well done, Ivan Obolensky. I am looking forward to reading more of your novels. Obolensky has woven a fascinating and enchanting web with his novel. An intellectual roller coaster ride, it took me to another place in time, and is a breath of fresh air in today's world where we sometimes forget the art of conversation and the importance of forgiveness and love. It has something for everyone, and I will certainly be reading it again and again to catch the subtle nuances and relive the surprises that come throughout the story! I am so pleased to have found this little treasure. It turned out to be quite surprising. I thought it would be just another haunted house mystery, but it was so much more. The characters are so well developed and the tale so complex I had trouble putting it down. It has a few spots where it drags and leaves questions unanswered throughout. But it is charming, mysterious, haunting, and uplifting. I throughly enjoyed it. A wonderfully engaging read. Five hundred pages that grab you and won’t let go of you, while taking you in a swirl of discoveries through the realms of magic, finance, love, passion and intrigue. Not for one moment did I feel it lacked research or knowledge of the subjects touched upon. It awoke many memories of my growing up. The splendor of a beautifully set table, the perfect orchestration of a well-served dinner. The joy of taking it for granted. While I mostly enjoyed this book, I think its completely misleading. I don't think this book is a mystery in any way. The cast of characters is interesting and their machinations are intriguing, the weekend was less than eventful. Lots on conversations but lacking. Also, the book seemed like it could keep its own time period straight. Overall, a decent read that isn't what I was expecting or hoping for. Thought it was going to be a ghost story in an old mansion but turned out to be mostly about financial dealings between the characters. I kept plugging along and finished the book but at the end I am confused with all the convolutions, twists,turns and hints of something spiritual or magical which didn't go anywhere. Confusing is the only way I can describe it. My favorite character was the dog. Ivan has a way of transporting you from one persons perspective to another's effortlessly. It was also interesting imagining living in a life that most do not have the opportunity , so that was fun! It is intellectually written, but I didn't need a dictionary haha. Looking forward to reading more from this great author! This is a Goodreads win review. This is a really excellent book about a mystery/thriller about tow men who remember their aunt died while reading a book. So they decide to investigate her death and they get involved in their own mystery. This is an interesting read based in the social scene of New York in 1970 when these characters lived in the high society. Eye of the Moon is a delightful story, full of family dynamics, intrigue and the occult. I found the plot to slowly unfold in a very compelling way as the characters' lives unfolded before me. The sections dealing with the powers of intuition were so very insightful. I learned much about the occult and can definitely see this work being produced as a miniseries ....and I can't wait! Rich in detail, wit, and gothic mystery, "Eye of the Moon" reads like a carefully crafted stage play. The world, albeit almost all contained within the mansion Rhinebeck, is precise and vivid, and the characters sharply drawn. If you enjoy witty banter and dynastic politics with a touch of Agatha Christie type mystery, you'll enjoy "Eye of the Moon". "Eye of the Moon" has it all... Facts and fiction. It takes you to experience an adventure full of mystery and magic - where all characters alive, or not, become your friends - I am looking forward to living a new adventure with a sequel. I so much want to know what happens next ... Very well written. Chapeau ! Challenging to get into but worth it. A very complex story about an upper crust family living in a mystical house by the Hudson river. I must admit I tried of the complexity about halfway through but was drawn back to it by that same complexity. Hopefully there will be more to come of this story as I felt the last third of the book was the most engaging part of the story. There could have a lot less of the first third of the book. "Eye of the Moon" is colored by the stories of his youth. It was inspired by two questions: If life has given us gifts, what do we owe for having squandered Ivan Obolensky grew up regaled by tales of his ancestors while surrounded by high society. Those stories of intrigue and adventure inspired him and nurtured his love of storytelling, which he brings to his writing, both fiction and nonfiction.